Over 6,000 farmers supply the Mavis Bank Coffee Factory with coffee grown from the Blue Mountain area, where it is thoroughly inspected and cultivated before it is sold. Only coffee grown in the legally defined Blue Mountain range can be certified as Blue Mountain Coffee. The area is favored by the ultimate combination of the ideal altitude, mineral-rich soil, gentle cloud cover, mountain shade and ample sunlight. Coffee is collected from farmers only after it is cherry ripe. The berries take longer than others to mature, and they are then hand-picked and floated in water on each farm. Floated berries are then discarded if they have underdeveloped beans or insect damage. Farmers then bring the good coffee to one of over 80 Mavis Bank Coffee Factory collection stations where it is floated again to ensure only pre-floated coffee is received into the factory. Collectors visit the depots daily and collect freshly floated coffee for pulping. This process starts late in the afternoon so that coffee can be pulped soon after picking. Once it arrives at the Factory, it is placed in large holding tanks and thoroughly inspected to eliminate any over fermented, green, or insect infested cherries. It is then washed to remove the mucilage, a sugary substance on the outer section of the bean. The product left after washing is a creamy, brown bean known as the wet parchment. The wet parchment is then placed on large concrete slabs called, barbeques, for drying. This can take as long as 5 days depending on sunlight conditions. During peak rainy seasons mechanical dryers are also used. The drying process involves getting the moisture in the beans to specific levels. During this time more assessments are made to ensure only top quality beans make it through. The next step is the resting period. The dried parchment is now bagged and taken to the warehouse where it will remain for at least ten weeks. This is a critical stage of the processing where certain unique characteristics occur. Once the beans have rested they are ready for hulling. Hulling is where the ‘husk’ or outer shell is removed and what emerges is the world famous green bean. The husk is stored in a silo and used as fuel in the wood dryers. After hulling, the bean is polished to remove the silver skin on the outer layer and is now ready for sorting. All beans are sorted and sold based on certain specific characteristics verified by the Coffee Industry Board. The beans are graded according to size: Grade I, Grade II, & Grade III. Next the beans must meet stringent tests regarding taste, body, and color. The last step is one final inspection, done by hand, where each bean is examined to eliminate any defect. 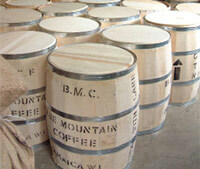 Beans are then loaded into barrels made from Aspen wood and taken to the Jamaica Coffee Industry Board who will inspect them and label them as 100% Jamaica Blue Mountain® Coffee beans ready for export to those licensed to purchase and distribute them.